Ashburton Grove - Arsenal news and Arsenal opinion: Three signings this week? -Wenger to clash with Capello -Fabregas: man or mouse? Three signings this week? -Wenger to clash with Capello -Fabregas: man or mouse? The countdown has well and truly now begun to next Saturday's Premier League kick off at St James Park and with many of our first team squad heading off to play for their countries or on the treatment table at London Colney, it doesn't give Arsene Wenger a lot of time to put his final preparations in place. Most concerning at this stage are the injuries to our key first choice players. 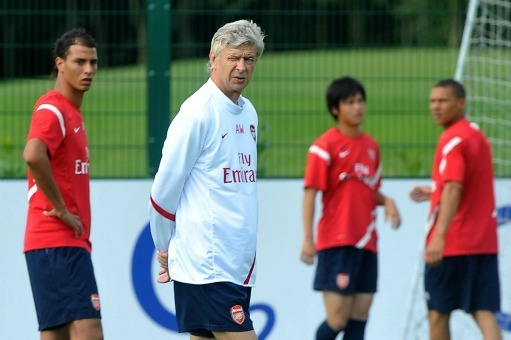 Robin van Persie, Thomas Vermaelen and Kieran Gibbs all returned from Portugal with problems. Of those three it seems the Englishman has the smallest chance of regaining fitness in time for the late kick off on Saturday, with the Daily Telegraph reporting he has a thigh strain. Then we have the players who didn't even travel to play in the Benfica game: Laurent Koscielny (muscular problem), Jack Wilshere (ankle), Theo Walcott (ankle) along with Samir Nasri (bruised foot) and Cesc Fabregas (broken heart). And that's not even mentioning Nicklas Bendtner, Emmanuel Eboue and Manuel Almunia (still under contract) who have all yet to secure moves away from the club. With regards to Wilshere, he's been called up for England, despite not being involved in the club's final pre-season friendly. Fabio Capello thinks his injury isn't as bad as Arsenal are making out according to some of this morning's newspapers. However seeing as England train at Colney, it will be a case of Gary Lewin giving Jack the once over before realising he isn't fit to play on Wednesday night and Wilshere returning to the treatment table of Colin Lewin.. This is probably the most shambolic pre-season I've seen at the club in my many years of supporting Arsenal. There doesn't seem to have been any sort of transfer policy. We've not been "very active" like it was suggested we would be. It's been hard to see how the manager has been working day and night to resolve the issues of last season when we still essentially have the same group of players at the club. One of the problems we've faced when trying to offload the players the manager no longer sees as having a future at the club is that the clubs we're offering them to can't or won't pay the wages they're on at Arsenal. Denilson must be having his weekly wage subsidized by the club because it would be very unlikely Sao Paulo could afford what Arsenal are paying him. What you would have expected to happen come the start of the summer was that all of our business would have been lined up and ready to take place. We'd know who we didn't need any longer and Arsene Wenger would have used his little black book to place the players he didn't want with new clubs. Then we could have gone out and replaced them with proven quality replacements, ideally with Premier League experience. However it's not happened like that. Here we are with six days to go until the team take to the field at St James Park with pretty much the exact same squad who couldn't buy itself a win in its final games of last season. If it hadn't been for Robin van Persie's goals, who knows where we would have ended up in the league. I'd much prefer to look on the bright side. We have invested in Gervinho who looks like he could turn out to be a bargain at £10m. And we've added Carl Jenkinson to the squad, who maybe raw and untested at this level, but who clearly has the heart and bottle as well as the fight we need in our defence. And the manager still has time to sign some new faces, even if he is leaving it rather late. This week could see three new signings according to the press today. By all accounts Alex Chamberlain will sign this week from Southampton. Joel Campbell will be another of our new arrivals. Then the manager will be turning his attention to one of the three central defenders he has targeted at different points during the summer. The two easiest to get to are Gary Cahill and Phil Jagielka who will both be at London Colney training with England. There is also the outside possibility we could move for either Christopher Samba or Scott Dann. The Daily Mail think Cahill is the leading candidate. Even if we don't sign a central defender this week, one thing is for sure, we'll need one before the transfer window closes. As I said in the blog yesterday, it is a case of who's need is the greatest. Arsenal's for the player or Everton/Bolton for the cash. The Cesc Fabregas transfer saga will continue to run this week no doubt. He's not been picked for Spain so will have a week to work on his fitness. The manager has already said he probably won't be ready in time for Saturday, so when will he be? It's not often that I agree with the Daily Star's Brian Woolnough, but his column on the Fabregas situation is spot on. I'd like to know where the Cesc Fabregas we all respected so highly has gone? The one who would make personal statements on the official website to deny stories in the Spanish press about him wanting to leave Arsenal. The man who spoke so highly of Arsenal and Arsene Wenger. It may be that he doesn't get his wish to move back to Spain this summer, so I think it's about time he started to realise that it is Arsenal who want him more than Barcelona do. Former vice chairman David Dein spoke to the BBC yesterday morning about Arsene Wenger and I have to say I agree with all the points he made. This will be one of the toughest starts to the season we face, but whilst I'm disappointed we haven't concluded our transfer business by now, I know it's not as simple as those who think Football Manager is a true reflection of how business is actually done in the game. Tonight Ivan Gazidis faces a grilling from members of the Arsenal Independent Supporters Association. It will be interesting to hear what he's got to say for himself. If he thought the questions he faced at the Arsenal Supporters Trust Q&A were tough, I think he should be prepared for a more hostile audience later. He made promises that we would be busy in the transfer market. That hasn't materialized so it will be interesting to hear his reasons for why that hasn't been the case.